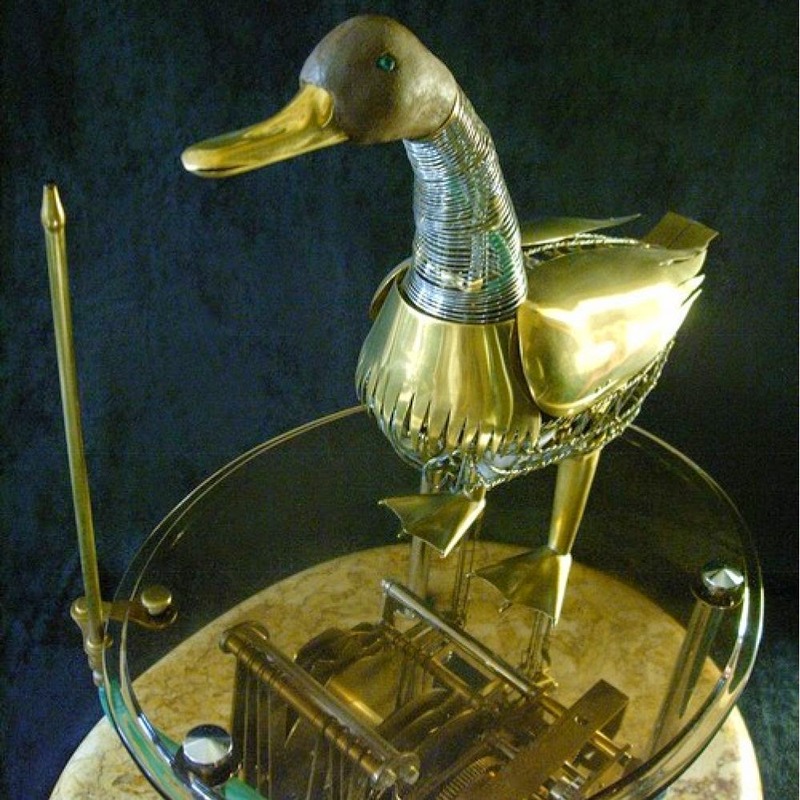 This beautiful, if slightly disturbing creation, is a modern replica, made in 1998 by automaton artist and restorer, Jacques Fréderic Vidoni, of one of 18th-century France's most celebrated automatons, the famous defecating duck of Jacques Vaucanson. Until recently it took pride of place in the musée des automates in Vaucanson's birthplace, Grenoble, a private museum, now closed sadly due to its proprietor's ill-health. In December 2013, Vidoni's duck was sold at auction where it made a cool 36,000 euros! Given the technologies at Vaucanson's disposal the original canard digérateur must have been a truly phenomenal piece of engineering. The duck was life-sized, constructed of hundreds of beautifully crafted parts covered in perforated gold-plated copper to allow view of the workings in its interior. It sat atop a substantial housing which concealed the clockwork mechanism. 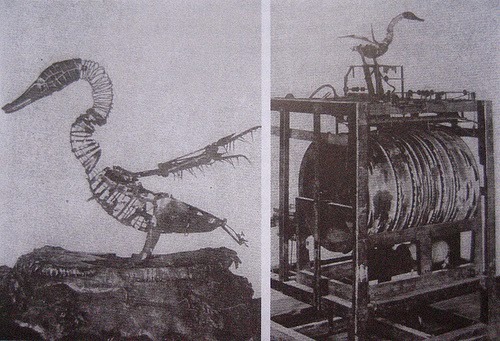 A weight wrapped around a lower cylinder, drove a larger cylinder which in turn activated thirty of so levers connected to the Duck's skeletal system. This allowed a wide repertoire of movements; the duck waved its head, wiggled its beak in the water, quacked and adjusted its position in a fair facsmile of the real bird Most impressively of all it appeared to eat pellets offered to it, with an realistic motion of it flexible neck, "digest" them and duly defecate. (producing authentic looking faeces made of dyed green breadcrumbs, rather than the more sanitary pearls of the replica). The defecating duck first appeared on display in Paris in the winter of 1738 in a rented hall, the grand salle des quatre saisons at the Hôtel de Longueville, where it caused a sensation. Its companions were two android musicians, a pipe-and-tabor player and a flute-player that had lalready been shown in the previous February. Admission was a substantial three livres, but Vaucanson earned himself him in a season several times the amount he had borrowed to finance the venture. Automata became the flavour of the moment, dominating the so-called cabinets de physique at the fairs of Saint-Laurent and Saint-Germain. Journalists adored Vaucanson. Pierre Desfontaines celebrated his exhibition in a long article in the Observations sur les écrits modernes as "a masterpiece of mechanics, a prodigy of genius, and a miracle of art". Prévost in Le Pour et le contre eulogised "the most marvellous piece of mechanics that has appeared to this day". Vaucanson even captured the fancy of Voltaire who (in the Essai en vers sur l'homme in 1737) celebrated him as "Prometheus's rival" and in 1744, in a letter to the comte d'Argental, commended the soprano Lemaure and the "duck of Vaucanson" as the only remaining attractions of the capital left "to remind you of the glory of France". Perhaps as a result of Voltaire's encouragement ,Frederick the Great, as early as 1740, contacted his agent in Paris to recruit Vaucanson to the Berlin court. The inventor was offered a pension of 12,000 livres but, scenting still greater glories at home, refused. 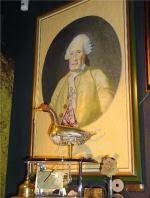 The duck and his companions meanwhile were profitably sold off in 1742 to a consortium of Lyonnais businessmen who took them to London, mecca of automata and similar entertainments, where they caused yet more of a stir. According to the prospectus they were to be viewed in operation at the Opera House in the Haymarket " at 1,2,5 and 7 o'clock in the afternoon".John Desaguliers, chaplain to the Prince of Wales, translated "out of the French original" Vaucauson's "Memoire to the Gentlemen of the Royal-Academy of Sciences at Paris" which was printed by T. Parker and sold in the Long Room of the Opera House in the course of the exhibition. There doesn't seem to be much in the way of detail about the precociously talented Vaucanson. There isn't the usual chatty 19th-century biography - the only full-one dates from 1966 and is completely out-of-print. He was born in Grenoble in 1709, the youngest of ten children. His father, who died when Jacques was just seven, was a master glovemaker. What little is known of his early life amounts to a couple of anecdotes: the young Jacques building a copy of the clock which hung in the church where his mother went to confession; a refusal to take part in lessons until his model boat had crossed the school pond. He attended the Jesuit college in Grenoble and later became a novice in the order of the Minims in Lyon, where he was furnished with a workshop and a grant from a local nobleman. 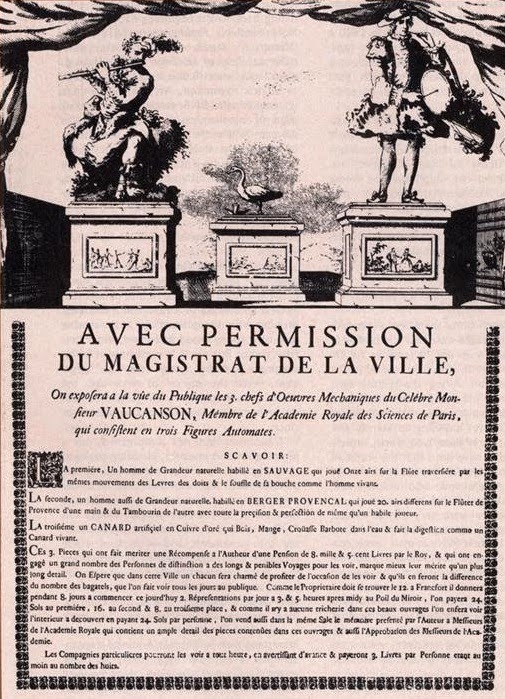 In 1727 - again so the story goes - he made some androids to serve up dinner to a visiting dignitary of the order, who discerned (quite rightly) his profane tendencies and had the workshop destroyed. Pleading the excuse of an "unmentionable illness", Vaucanson was now released from the order and immediately ran away to Paris, where he may possibly have attended classes in anatomy and medicine at the Jardins du roi He soon produced enough work to go on an exhibition tour of Brittany and in Tours met one of his main financial backers, returning to Paris with enough money to masquerade as a gentleman, in floral garments and carrying a sword. 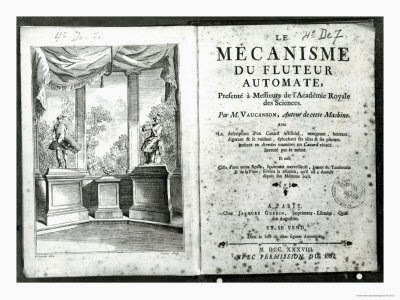 He now fell ill again - Vaucauson suffered from bowel troubles, hence perhaps the interest in defecation - and, in a state of delirium, hit upon the idea for the flute-player automaton which launched his career. Vaucanson, his automata and "science"
One of the great puzzles about Vaucanson is his almost universal acceptance by the Parisian establishment, in particular the most illustrious members of the "scientific" community. On the face of it automata belonged firmly to the world of fairground showmanship and illusion, along with circus acts, shadow theatre and of course the equally popular (though altogether more suspect) waxworks of Doctor Curtius. Certainly the modern home of the replica, the small eclectic collection of Frederick Lara in Grenoble, had more of Ripley's than the Smithsonian about it. The answer lay partly in the strategies of the young inventor himself, who besides having startling ability, was clearly a man of persuasive personality and visionary marketing strategy. Although the son of a mere glovemaker, Vaucanson was educated and took himself very seriously, taking trouble to articulated his purpose in a number of publications. Members of the Academy were persuaded to view the Paris exhibition after which Vaucanson presented his memoir addressed to them. Fontenelle duly wrote a flattering certificate in which he attested to the "intelligence of its author, and his great knowledge of different aspects of mechanics". Vaucanson's central point - and the lynchpin of his "scientific" credentials - was the claim that his automata did not merely create the illusion of their living model but sought to replicate it. Thus his flute player was the result of prolonged study of the structure of the musical instrument, the mechanics of play and the "strength" and velocity of wind needed to achieve the sound. The automaton really played, without trickery. It was, as it were, an experiment in the understanding of how the various components - instrument, mouth, fingers, airflow - worked together. Hence Desaguliers's claim that Vaubanson's memoir "in a few words gives a better and more intelligible Theory of Wind-Muscick than can be met with in large Volumes". Similarly the duck purported to be an essay in the understanding of physiology. Vaucanson explained that he left the workings of his mechanical duck "exposed to view" because he wished "rather to demonstrate the manner of the actions than to show a machine...: : Perhaps some Ladies, or some People, who only like the Outside of Animals, had rather have have seen the whole cover'd; this is, the Duck with Feathers .But besides, that I have been desir'd to make every Thing visible; I would not be thought to impose upon the Spectators by any conceal'd or juggling Contrivance.". Vaucauson's aspiration to replicate natural functions chimed with a definite current of thought in the 1730s when a number of Parisian experts began to make "moving anatomies" of the human body. Several prominent surgeons - La Mettrie and Quesnay among them - advocated the building of hydraulic machines to demonstrate physiological facts. In this vein in 1741 Vaucauson proposed the construction under royal commission of a new automaton, "to perform experiments on animal functions, and thence to gather inductions to know the different states of health of men so as to remedy their ills. This ingenious machine, which will represent a human body, could in the end serve to perform demonstrations in an anatomy lecture". He was duly recruited "to execute in this manner the circulation of the blood", a fraught and unsuccessful project from which he was felicitously rescued in 1742 by his appointment as inspector of the silk industry. What became of the duck? The subsequent fate of Vaucauson's three automata was much less illustrious. They changed hands a number of times . A perfumer and glovemaker named Dumoulin travelled with them through Europe and pawned them in Nuremburg. They were next seen, boxed up in an attic, by the German writer Christoph Friedrich Nicolai, who published an account in 1783 in which, to Vaubauson's embarrassment, he pointed out that, despite its innovative rubber tubed intestine, the duck's central function was a fraud; the duck didn't "digest" at all; the ducky pooh was merely concealed in a hidden compartment and released at the appropriate moment. (The magician Jean-Eugène Robert-Houdon is often credited with the revelation in 1844 but he was not the first). As a result of Nicolai's attention, the automata were rescued by Gottfried Christoph Beireis, doctor to the duke of Brunswick and collector of curiosities. As seen by Goethe in 1805, they were "utterly paralysed"; the duck, a skeleton without feathers, "still devoured the oats briskly enough, but had lost its powers of digestion"
Twenty years later a theatrical impresario called George Dietz rescued the duck from another pawnbroker, had it renovated and took it to the Universal Exhibition of 1844. It then supposedly resurfaced in a museum in Krakow, where it was destroyed, this time definitely, by fire in 1882. Subsequently, however, some mysterious photographs came to light in the archives of the Conservatoire National des Arts et Métiers in Paris - the core of which was Vaucanson's own collection. Nothing is known for sure and opinion differs as to their authenticity but, as Gaby Wood points out, the pictures are strangely moving: "They show a crude, featherless bird, made of spring-like windings of wire and perched on a huge wooden frame that contains a mechanism resembling a watermill. They are extraordinary views, reminiscent of the sorry skeleton Goethe described." Such, then, are the ruined after images of Vaucanson's Enlightenment dreams. Website of Fréderic Vidoni, with specifications and additional videos of his creation. Lara was by all accounts an interesting character: a accomplished mime artist and imitator of automatons as well as a collector. 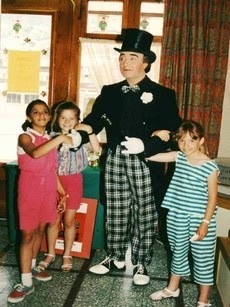 His little museum emphasised not "science" but childhood, imagination and "mechanical dreams". Extract from Gaby Wood, Living dolls: A magical history of the quest for mechanical life (2002) published in The Guardian.